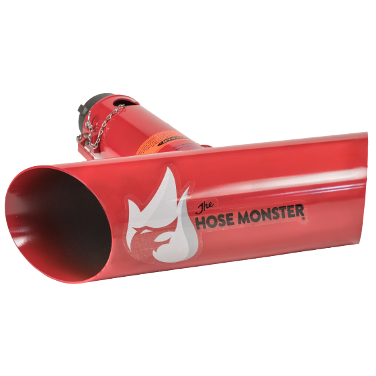 The 2 ½” Hose Monster cancels the thrust of high-velocity water flow and is FM Approved. It includes a built-in, reversible pitot and measures flows from 533 to 1460 GPM. For lower flow-rates, a Nozzle Insert can be used. The 2 ½” Hose Monster cancels the thrust and is FM Approved. The Hose Monster comes with a built-in, reversible pitot. Minimize pitot damage by rotating the pitot into the downstream position while flushing debris is present. When the water clears, re-position it into the read position. If a pitot becomes damaged, in spite of these precautions, it can easily be replaced in the field with simple hand tools. (PCK Pitot Change-out Kit) We also offer a repair service for damaged pitots. For lower capacity systems use FM Nozzle Inserts. Simply slip a Nozzle Insert into the inlet of the Hose Monster. Because it is the correct length, the nozzle outlet is positioned ½ the diameter from the pitot. Available in sizes of 1 ⅛” and 1 ¾” so you can read flow rates as low as 118 GPM.